Peel off masks are meant to remove dead skin and clean pores. I really love to use these masks as you can feel a new soft skin after peeling and the peeling process is enjoyable as well. 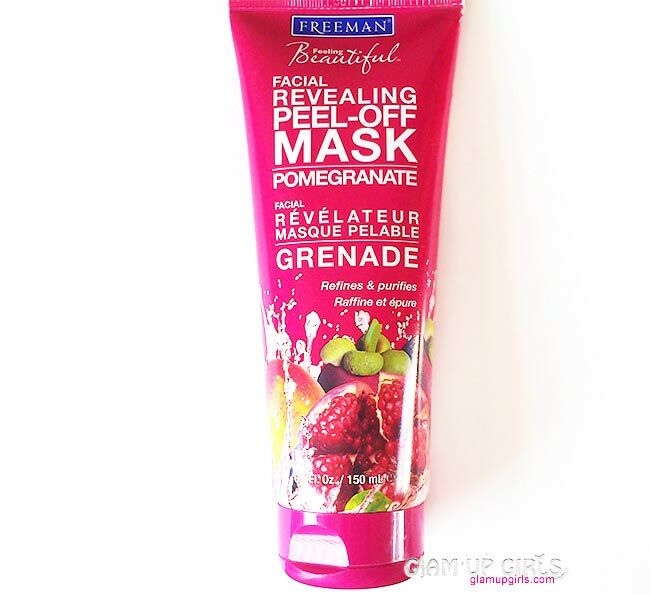 Freeman facial revealing mask is my first peel off mask from Freeman and i have used it quite often. Lets explore this mask in details what it has to offer. Peel-off mask with super nutrients you'll only find in nature! Pomegranate and 8-antioxidant blend gets you gorgeous. Perfect for all skin types. Immerse skin with super nutrients found only in nature! This Pomegranate-infused mask gently purges dirt and excess oils from skin for a cleaner, refined surface. An 8-antioxidant blend of Acai, Blueberry, Cranberry, Goji, Mango, Mangosteen, Noni, and Pomegranate guard against free radicals and environmental stress. Get gorgeous as you reveal fresher skin. Perfect for all skin types. Directions: Apply evenly to face, avoiding eye area, eye brows, hair line, and lips. Leave on 5-10 minutes or until dry. Gently peel off mask. Rinse with warm water. Use two times a week or as often as needed. 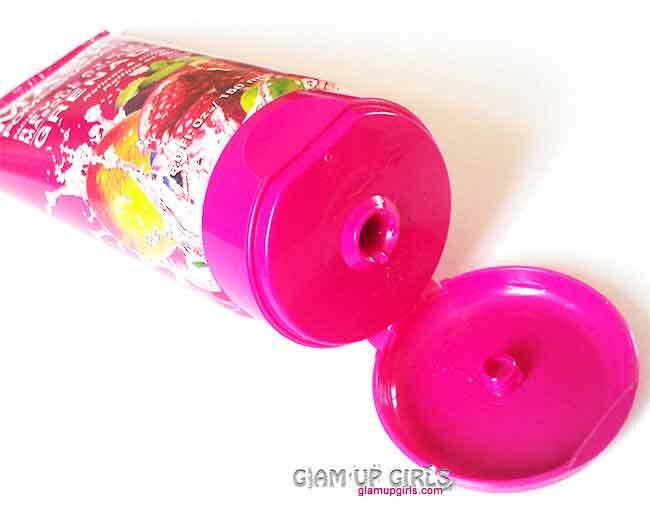 This mask comes in usual squeezable plastic tube which is in dark pink color. The mask itself has no color like mostly peel off masks. 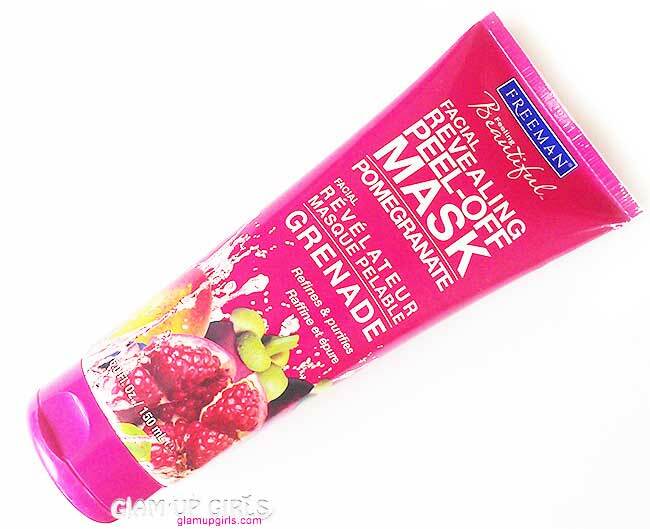 The texture of this mask is very thick gel like which has very noticeable fruity smell. The smell can be bothering for very sensitive nose but it fades after a little while. As i have tried many peel off mask i found that the consistency of this mask is very thick compare to any other which makes it little difficult to apply and spread as thin layer. I try to avoid it applying on eyebrows and near hair line so it won't stuck in hairs because it is little hard to remove it from hairs. As i said it has thick texture after drying the peel off layer is also strong then others and you can peel a whole layer without tearing it. You might think that this troublesome but i think that it is the one good part as it stretch your skin and remove dead skin more then others and i feel my skin more soft, firm and clean. This mask takes little more time to dry then others mostly around 15 to 20 minutes. Try to apply thin layer as much as you can to avoid long time wait for drying. I try to use this mask once a week if not twice and i love how i feel after using it. It definitely removes dead skin and excessive oil and my skin feels clean and lifted. It is also perfect to use before heavy makeup for any event. It provides clean and fresh surface on face to apply any foundation. Overall i find this mask great for summers to keep my skin clean and fresh and if you love to use peel off mask do give it a try.